Egg Harbor Lodge is a family business, established in 1976 by Bob and Gloria Hastings. Today the Lodge is operated by their daughter Sarah Sawyer and her husband Mark. Together, they continue the tradition of warm hospitality that has kept guests returning to Egg Harbor Lodge year after year. 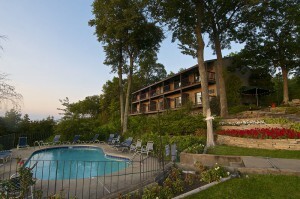 From the moment guests are greeted at the front desk of the Lodge, with its breathtaking view of the waters of Green Bay, they know they have arrived at an exceptional location in beautiful northern Door County. On site, guests can enjoy free use of a putting green, a tennis court and bicycles, enjoy a swim in Egg Harbor Lodge’s heated pool or take a brisk walk along the quarter-mile nature trail. Egg Harbor Lodge is also a short walk to a variety of restaurants and shopping destinations in the heart of Door County.